SpeedwayPlus | How Old is Too Old? Greg Hancock became the oldest World Speedway Championship winner in 2011. He achieved this at the ripe old age of 41 by deposing the reigning champion, Thomasz Gollob - himself only a year Greg's junior. Both fully deserved their victories, and are living proof it is impossible to predict when a speedway rider might reach the pinnacle of the sport. Indeed, it would be a brave person who would bet against either being crowned again in 2012. I was skipping through a recording of some of the 1980s world finals soon after Greg's win and was struck by how much younger the top riders seemed to be back then. I knew Ivan Mauger was a few days short of his 40th birthday when he claimed his sixth crown a little earlier, but it was the average age of the fields I found surprising. It got me wondering whether the age profile of the top riders had changed over the years and so I compiled a list of all the world finalists in the post-war era. I had to settle for their years of birth, as specific details about many of the once top stars were surprisingly hard to acquire. My thanks go to all who helped by providing information. The first post-war final, in 1949, turned out to be the oldest in terms of rider age. It was dominated by pre-war riders, with Tommy Price taking top spot as a 37-year-old and the 42 year old Jack Parker coming second. The average age of the field was just over 34. However, the early 1950s saw young riders such a Ronnie Moore, Ove Fundin and Barry Briggs not only arrive on the scene, but also have a major impact on the world championships for years to come. The net result was a sharp dip in the average age of the world finalists and a subsequent recovery. This is illustrated in the Figure below, which also shows a general decrease in the average age of the finalists from the mid-1960s until the introduction of the GP Series in 1995. 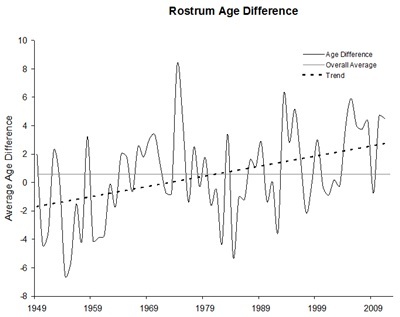 The average age of the rostrum finishers is given in addition, and this has tended to follow the trend for the competitors. Nevertheless, the top three have become gradually older than the rest of the field, especially since the move towards the current GP format. This difference is shown in the graph below. 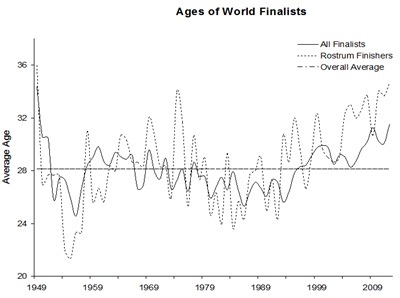 The average age of the world finalists is higher now than it has been for about sixty years. Moreover, the rostrum positions have tended to be filled by riders typically older than the rest of the field. Perhaps there are several explanations why, but maybe the recent changes are a reflection of the growing importance of sponsorship deals. The cost of competing has become increasingly high thanks to the adoption of expensive technology, and this has made it difficult for young riders to become quickly established on the world stage. There are exceptions of course. Emil Sayfutdinov made a sensational debut in 2009 and broke almost every GP record in regard to his age. He was 19 at the time and had a precocious talent that seemed unprecedented in speedway. But it is important to remember that Moore, Craven and Lee lifted the trophy when only 21, Peter Collins was just a year older at 22, and Fundin and Briggs were 23 when they won their first of the nine crowns held between them. Indeed, Lee missed out in a run-off for third place while still only 18. Will we see youth dominating world championship speedway again? Who knows, but it seems unlikely to me. Not only because the GP format works against it, but also because it has become very much a money game, in which established riders will find it easier to maintain their positions at the top. But that doesn't detract from Greg's remarkable achievement. And just to make him feel a little younger, Aub Lawson was the oldest rostrum finisher when he finished third in 1958 aged 44. He was also the oldest finalist when he made his curtain call two years later, at 46. So, you'll have to hang around a bit longer yet if you want to be remembered as a golden oldie, Greg! "Ken's research identifies "a general decrease in the average age of the finalists from the mid-1960s until the introduction of the GP Series in 1995". So surely, the key difference is the switch from one-off finals to a SERIES? Nowadays the rider who becomes "World Champion" is the most consistent over the whole campaign which will, thereby, inevitably tends to favour those with the most experience of racing and the tracks themselves as well as requiring they ride best, mechanically well maintained equipment. These characteristics are probably most likely to come with age."